Now I have tried lots ofdifferent pizza bases with different results and taste, and now I have a winner! I started from a Ciabatta recipe that I found online a while ago. It's probably the closest "bread" I can think of as a LCHF: er. 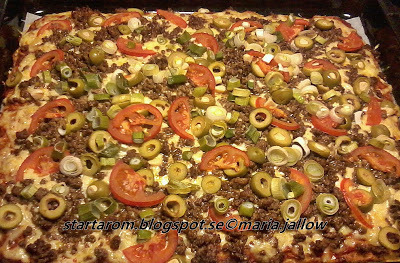 Today I tried to bake it as a pizza base with a little modification. First and foremost, it would fill my roasting pan so I did double everything. Take out two bowls and mix the wet ingredients well with a whisk. Mix together the dry ingredients in a separate bowl and then pour the mixture into the dry and mix with a wooden fork. Pour it in a roasting pan, preferably with a baking paper. Do this as fast ad you can, the better it is possible to "spread out" the batter at the plate. If you wait the batter swells and it becomes more difficult to smudge because of the husk. Bake the base for a maximum of 30 minutes and take it out. Meanwhile, prepare what you want on your pizza. Today we did a taco-inspired pizza and I made a spice mix that I was inspired by the last weekend when I made Indian cuisine. I dry roasted 3 tsp of cumin seeds, and put them together with 4 small garlic cloves, some chiliflakes, about 2 tsp coriander seeds, a little chipolte pepper (smoked chilli), salt, oregano and some garlic powder in a mortar. I mixed the spices with minced meat which I fried with butter. I had a tomato sauce that I made before. Grate the cheese, about 4 ounces - I had three pieces of cheese with different tastes. Likes to mix different cheeses. Spread the tomato sauce on the pizza base, then add the cheese. Slice olives, fresh spring onions and tomatoes in the oven at 200 degrees until the cheese has melted. Really good! If you like a thin pizza base so you can scrape off a bit of pizza batter and bake it as small buns or what you like. Do not be afraid to try!